Bibliothek, Hörsäle, Computer im PC Pool, International Office, Profs...sag uns was du uns schon immer sagen wolltest. trendence und WIWEX laden Dich zur größten Studierendenbefragung in Deutschland ein! 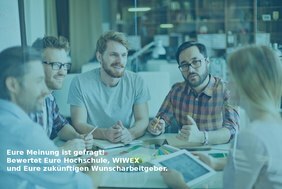 Gebe uns ein Feedback zum Studium, Deinen Karrierevorstellungen und zur Arbeit von WIWEX. Am Ende bekommst Du Deinen persönlichen Karriere-Check zum Download. Dort kannst du dein Ergebnis mit dem deiner Kommilitonen vergleichen. Für alle TeilnehmerInnen gibt es natürlich das Karrierebuch "Deutschlands 100 Top-Arbeitgeber" mit wertvollen Tips zur Bewerbung. Zusätzlich hast du die Chance auf tolle Preise z.B. Eventim-Gutscheine, einen Kindle Voyage eReader, Shopping-Gutscheine und vieles mehr! Mache mit beim trendence Graduate Barometer 2019! trendence and WIWEX invite you to take part in the largest annual student survey in Germany! In this survey you may give your opinion about your future career and how satisfied you are with your university and also the work of WIWEX. At the end of the questionnaire you'll receive your own personal career check which you can compare with the results of your collegues. The results will be published in spring 2018. HU was in the past ranked in one of the leading positions and we are eager to see if we can remain there and work up to your expectations. All participants will receive the book "Germany 100 Top-Employers" with valuable hints for applying at these companies. In addition you have the chance to win great prizes, e.g. an eventim voucher, a Kindle Voyage eReader, shopping vouchers and many more! Participate in the 2018 trendence Graduate Barometer! Protection of your data is important to us. Your anonymity is assured at all times. You can find detailed data protection information on the start page of the questionnaire. If you have any questions or suggestions, please feel free to contact trendence (feedback@trendence.com ).